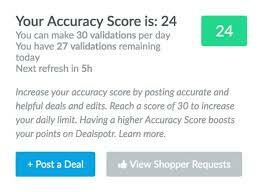 Dealspotr lets you post deals you find, similar to Slickdeals, but you get points you can use towards Amazon gift cards. There are several ways to post deals: Codes, coupons, site-wide deals, product deals, in-store or online, freebies, etc. As you post deals, you get points for them, points for completing daily checklists, and points based on your accuracy score. The higher your accuracy score, the more points you earn for your work. You can also validate or correct other posts from other users. This earns you points and helps your accuracy levels as well. Minimum payout is $10 in Amazon gift cards. You have to earn 10,000 per $10 gift card. Click Here to Get Started! You will receive 2000 points for completing sign up and an additional 2000 when you complete your first daily checklist!